Sydney Tree Removals has helped many residential and commercial properties in Church Point recover from storms. The devastated trees on their properties were quickly removed to ensure the safety of the families and employees that reside on them. We have continued our relationship with many of our customers, returning to the Church Point to provide property maintenance, tree pruning, and commercial tree services. Our customers have learnt that prevention is always better than repair. Do you have any branches or trees that pose a risk to your building and safety? Once a tree has reached their useful life, been poorly maintained, lopped in the past, or damaged by storms - they can become a liability and threaten your property or family safety. 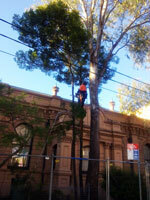 We are able to travel anywhere in the Northern Beaches to give you an unbiased assessment of your tree needs and quickly and efficiently provide practical solutions in removing them. 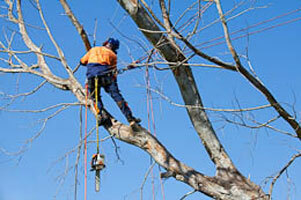 We offer more than tree removal in Church Point, we also offer a variety of palm and tree pruning. Some common tree pruning works include crown thinning, selective pruning, dead wooding, crown lifting, remedial pruning, formative pruning, palm pruning and clearance from transmission and power lines. Once a tree has been lopped or removed in Church Point, there is still the issue with removing the tree stump. Our efficient stump grinding service is the easy way to remove the rest of the felled tree to allow you to plant, concrete, pave, or tile over the removed tree site. There is no better way to make your garden or property in Church Point drought tolerant and resistant to weeds than laying a layer of mulch on it. The mulch also provides nutrients to the plants as it breaks down while acting a blanket to prevent water evaporation. Our mulch is suitable for almost any garden or property. We can deliver mulch to Church Point or anywhere in the Northern Beaches for a fraction of the cost of buying it from a nursery.